xport Lotus Notes email to Outlook 2019 without losing any data with the help of Lotus Notes to Outlook migration tool. NSF export tool supports to export Lotus Notes mailbox items such as emails, contacts, tasks, notes, journals, etc. NSF extractor tool allows to save Lotus Notes contacts in separate PST file. 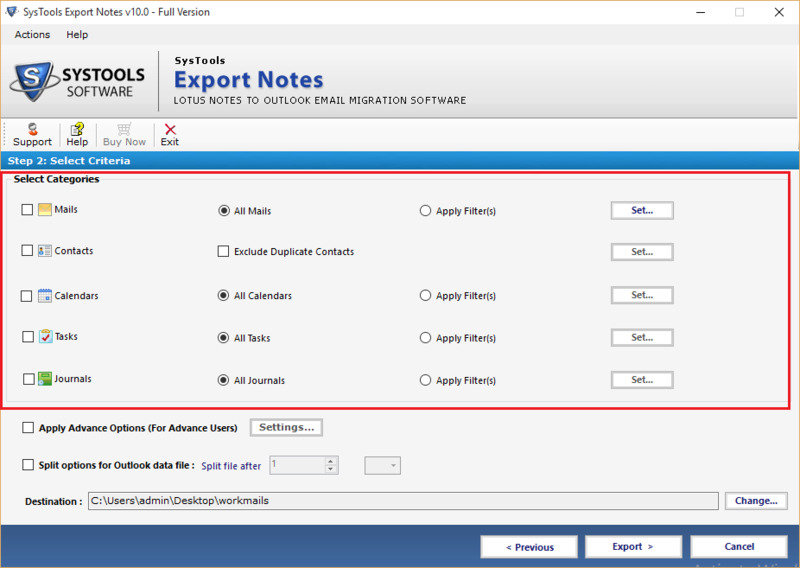 Apart from, the tool also allows to export selected folder from Lotus Notes to Outlook 2019, 2016, 2013, 2010, 2007 and so on. NSF Export tool provides the freedom to its user to export selected mailbox items such as emails, contacts, tasks, notes, calendars from Lotus Notes to Outlook with the help of data filter option. The user need to select date range From and To. NSF extractor tool provides the advance setting option to maintains the data of NSF mailbox as per requirement while export Lotus Notes email to Outlook 2019. The advance setting option includes the option such as maintains internet header of NSF emails, remove encryption from NSF mailbox. Apart from this, the Lotus Notes to Outlook migration tool provides the option to translate canonical names to SMTP format as per names.nsf file. Export Lotus Notes email to Outlook 2019 freeware also provides the option for customized folder to folder mapping of Lotus mailbox folders. Download NSF Extractor Converter software for free to export Lotus Notes email to Outlook 2019 without any data loss. The demo version of NSF export tool only allows to save 25 items per folder to Outlook PST.